Tired of seeing a never-ending barrage of digital ads that seem to know you all too well? How about the constant threat of malicious hackers breaching and stealing your personal information? With a Private Internet Access VPN: 2-Yr Subscription, stop the onslaught of targeted advertising and protect yourself from nefarious online activity as you surf the web with complete peace of mind! This VPN uses high-level encryption to put an end to incessant digital advertising. Meaning, it prevents data mining and blocks ads and trackers so you can browse with total anonymity and never have to deal with frustrating targeted ads again! Plus, it blocks malware — even when you’re connected to public WiFi — to protect you from digital deviants around the world. 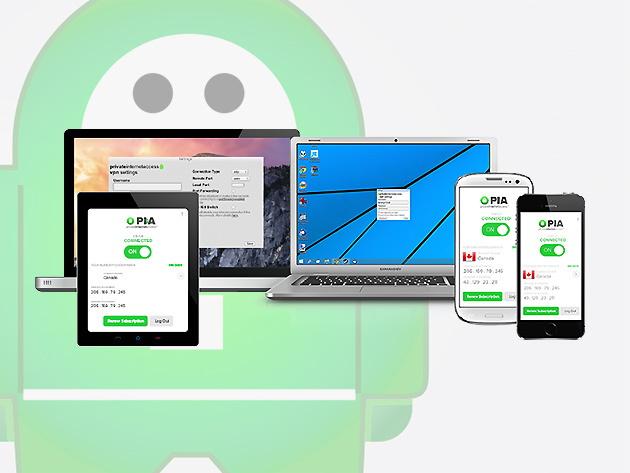 Able to operate on 5 devices simultaneously, this VPN also cloaks your IP location and empowers you to bypass censorship filters so you can access content regardless of geographic restrictions. Get a 2-Yr subscription to Private Internet Access VPN at IGB Deals for $59.95, which is 63% off its original price of $166.